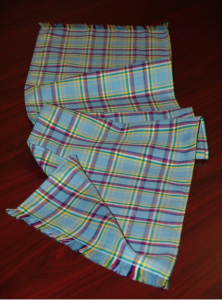 Yukon Tartan has been the official icon of Yukon Territory since 1984. Like all Canadian tartans, its colours symbolize the unique characteristics of its home. The blue represents the sparkling glacier-fed waters and the clear skies. Magenta reflects fireweed, the Territory’s floral emblem. Green represents the forest and purple mountains. White depicts the snow while yellow represents the midnight sun. Broken yellow lines represent the nuggets of the Klondike Creek Gold. The fabric is woven of 100% merino wool. As a Centennial Project in 1967, using crayons and graph paper, Janet Couture gave birth to this distinctive fabric. The journey from conception to completion was long and tedious, covering nearly twenty years. Designed by Janet in 1965 it was proposed as a tartan in 1967. It was finally accepted as a tartan in October 1984 by Lord Lyon King of Arms of Her Majesty New Registry House in Edinburgh, Scotland and accepted as Yukon’s official tartan with the passing of the Yukon Tartan Act on Nov 29, 1984. Delays were partly a result of concerns over copyright issues and because the fabric did not meet the vigorous specifications of a tartan. Initially it was considered a plaid. In a plaid the stripes are woven in a repeating sequence, while in a tartan the stripe sequence is reversed. Weaver, Diane Parenti, of Annie Lake Road, Yukon wove the first piece of Yukon Tartan. In 1984 she was asked by the Heritage Branch of Yukon Territorial Government to create a sample to be submitted to Scotland for approval. Unable to find the correct colour for the fireweed she hand dyed yarn until the appropriate colour was created. She wove the fabric as a tartan, not a plaid. Throughout the late 80’s and 90’s this beautiful fabric was very popular. First the fabric was sold in Whitehorse by Hougen’s store and later by Stitch’n’Time. But when both the fabric store and the Mill in BC which wove the fabric went out of business it became very difficult to obtain. In 2005, Lois Gillis, a Nova Scotia transplant to the Klondike set out to nurture its rebirth. Her passion for tartan and love of the North were combined. After raiding friends’ sewing stashes, scowering yard sales and begging strangers she tracked down a supplier in British Columbia. As a result of this Mill’s closure in 2014 Yukon Tartan is now woven in Scotland by the highly skilled weavers of the famous Ingles Buchanan company. The tartan is of the highest quality merino wool, reproduced in the registered colours.